I have lots of parents in my classes who have children with dietary restrictions or predilections. We routinely discuss how to adjust each recipe to accommodate Janie’s gluten-intolerance or Jack’s aversion to the color green. I am convinced the universe gave me Mr. Picky and Miss Vegetarian so that I would be more understanding of the challenges my students face. That I am. 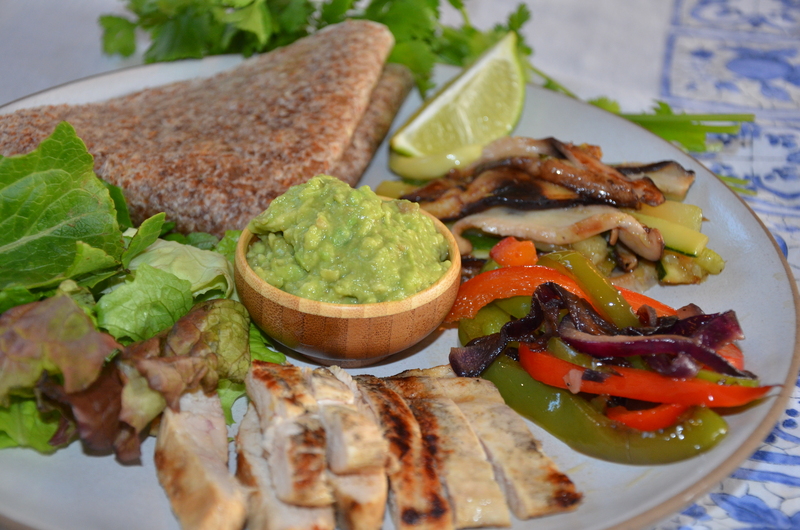 The good news is we had fajitas last night for dinner! The reason I say it was good news is because fajitas really lend themselves to each person customizing his or her plate. So whereas Mr. Picky likes to load up on chicken and guacamole with one token slice of zucchini, I am happy with the reverse, choosing mostly vegetables. I didn’t stress out about feeding Miss Vegetarian last night since we also had black beans and shredded raw cheddar cheese from the farmer’s market. She made two lovely roll-ups with sprouted grain tortillas and all was wonderful, at least in the protein department. (She really needs to stop borrowing her sister’s clothes without asking.) The next great thing about fajitas is that if you have leftovers, they can go into a darn good omelet or quesadilla the next day. Daughter #1 had some of the extra chicken and vegetables chopped up and added to some leftover green rice from my class the day before (I’ll have to give you the recipe one day) and brought it to school in a thermos. I think the traditional preparation of fajitas using skirt steak is just fine, but we don’t eat much beef here. Regardless, you can use the same marinade for beef and it will be delicious. You can also broil the meat, if you don’t want to grill. 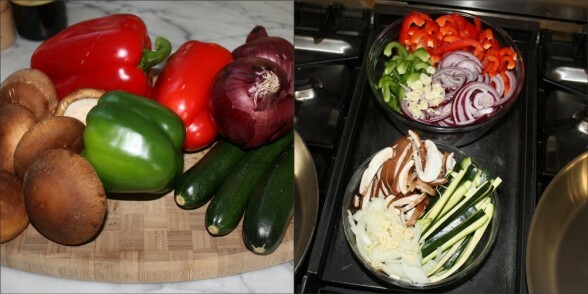 But more than that, I never limit the vegetables to just bell peppers and onions. I usually make an additional pan of sauteed zucchini and shiitake mushroom strips and find that to be my favorite, although I also love julienned carrots and sauteed spinach, too. There is always something to please every palate! Combine garlic, sea salt, pepper, cumin, lime juice, oil and cilantro in a non-reactive container, such as glass. Add meat to marinade and turn to coat well. Marinate for at least 1 hour at room temperature or overnight in the refrigerator, turning occasionally. Preheat the grill to medium heat. 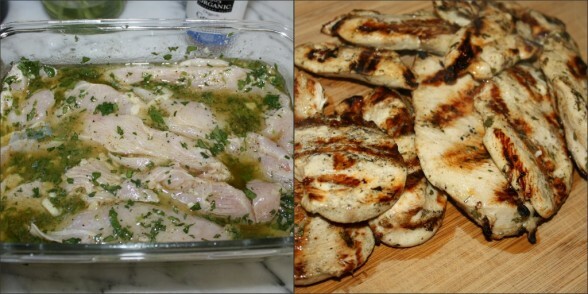 Remove chicken from refrigerator 30 minutes before grilling. Grill chicken a few minutes on each side until cooked through. Heat oil in a large skillet over medium heat. Add peppers, onion and garlic. Season with salt and pepper to taste. Saute the mixture, stirring, for 10-12 minutes, or until softened. You can add the cooked, sliced meat to the vegetable mixture and combine everything or serve both separately. Warm tortillas on both sides over medium heat on a griddle pan. Or if you are heat a large amount, wrap the entire stack in parchment paper, then aluminum foil and heat through in a 350 degree oven. Serve with desired accompaniments. You can also broil the meat using a broiler pan. Do Ahead Timesaving Tip: earlier in the day or the night before, marinate the meat and/or slice all the veggies. Keep in an airtight container in the refrigerator. Can i replace the cumin with something? chili powder? anything? or at least use less? If you dislike cumin, sure you can reduce it. A little chili powder would taste nice, too. This came out soooooo delicioso!!!! Proof being I made it for a Mexican that loved it!! Muchas Gracias!!! Brave of you! Well done!! So happy to hear someone else eats zucchini with their fajitas!! I always get weird looks when I include it for our guests and friends! 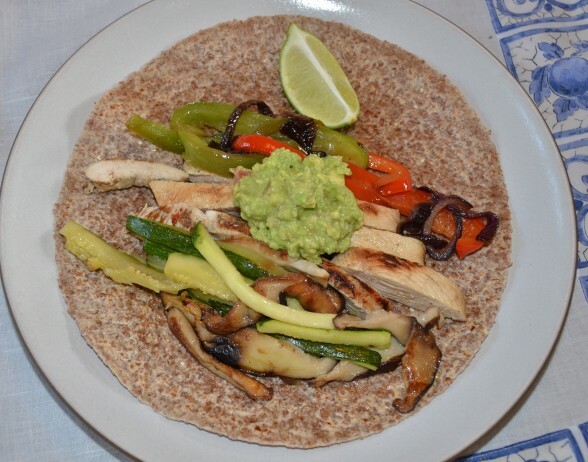 Actually, zucchini and shiitake mushrooms is my favorite fajita combination! You are holding out on me!!! you know I love chicken, I am going to tell my wife to check this recipe out, looks really good!!! I can tell you first hand this dish works particularly well when trying to feed a large number of house guests. Any leftovers? I’m starving! I’ll bring my own fork. Haha! You can whip these up with your eyes closed. We love chicken fajitas so I can’t wait to make this dish! It looks amazing! I’m going to try this on Saturday night.